1.Park on a level surface and apply the parking brake firmly. 2.Shift the shift lever into P (Park). 3.Activate the hazard warning flasher. 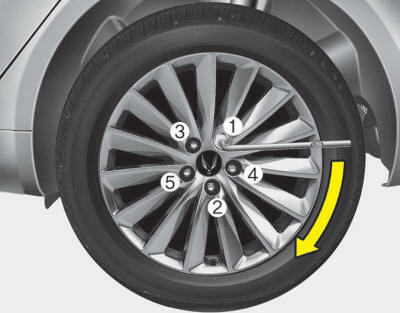 4.Remove the wheel lug nut wrench, jack, jack handle, and spare tire from the vehicle. 5.Block both the front and rear of the wheel that is diagonally opposite the jack position. 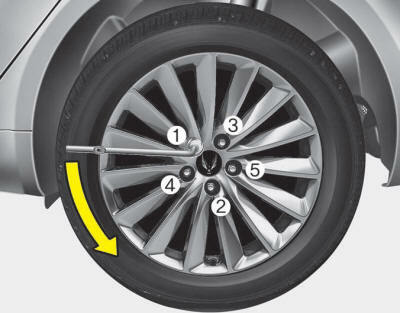 6.Loosen the wheel lug nuts counterclockwise one turn each in sequence of number, but do not remove any nut until the tire has been raised off the ground. 7.Place the jack at the front or rear jacking position closest to the tire you are changing. Place the jack at the designated locations under the frame. The jacking positions are plates welded to the frame with two tabs and a raised dot to index with the jack. Place the jack not to damage to the plastic guard. If you place the jack at the plastic guard and jack up the vehicle, the plastic guard may be damaged. 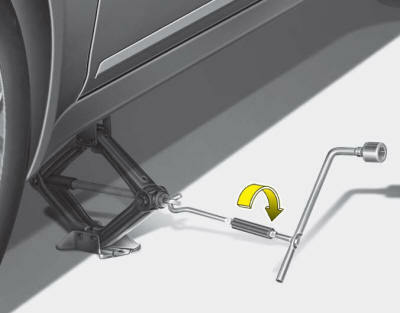 8.Insert the jack handle into the jack and turn it clockwise, raising the vehicle until the tire just clears the ground. This measurement is approximately 30 mm (1.2 in). Before removing the wheel lug nuts, make sure the vehicle is stable and that there is no chance for movement or slippage. Wheels may have sharp edges. Handle them carefully to avoid possible severe injury. Before putting the wheel into place, be sure that there is nothing on the hub or wheel (such as mud, tar, gravel, etc.) that prevents the wheel from fitting solidly against the hub. If there is, remove it. If there is not good contact on the mounting surface between the wheel and hub, the wheel nuts could come loose and cause the loss of a wheel. Loss of a wheel may result in loss of control of the vehicle. This may cause serious injury or death. Then position the wrench as shown in the drawing and tighten the wheel nuts. Be sure the socket is seated completely over the nut. Do not stand on the wrench handle or use an extension pipe over the wrench handle. Go around the wheel tightening every other nut until they are all tight. Then double-check each nut for tightness. After changing wheels, have an authorized EQUUS dealer tighten the wheel nuts to their proper torque as soon as possible.